If you've spent any time in the tile industry, care deeply about quality tile installation, and embrace installing tile according to industry standards, you will have heard of Scott Carothers, director of certification and training for the Ceramic Tile Education Foundation (CTEF). However, if you're new to tile and just exploring tile installation certification, Scott is someone you will soon encounter and quickly appreciate for his deep knowledge, high standards and intense passion. CTEF: Scott, what is your background? 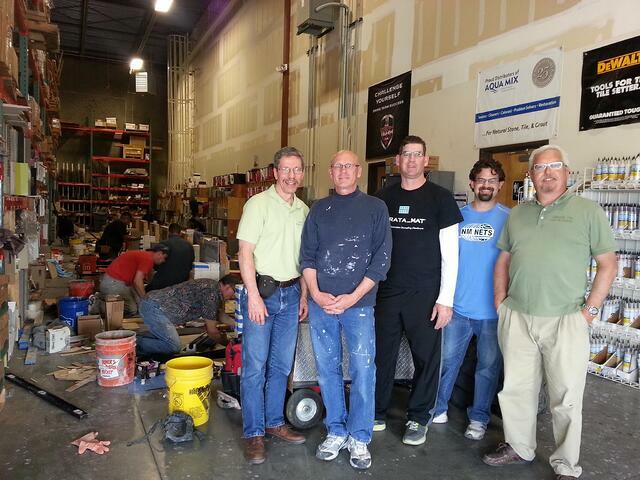 How did you get started in the tile business? SC: I walked into a local tile store to get a price on the tile work for a residential remodeling project I was bidding for the general contractor where I was working. After small talk, the owner asked, “Why don’t you buy this place?” I said thanks, but no. About a month later, I was back in the same store for another bid when the owner asked, “Would you buy this store if I financed it?” Two months later, I was in the retail tile business. CTEF: What is your role with CTEF? SC: I am the Director of Certification and Training at CTEF. CTEF: What inspired you to take on the position? SC: Through my involvement as a Board member of the National Tile Contractors Association (NTCA), Bart Bettiga, the Executive Director, called me asking if I would be interested in running CTEF. I was honored by the offer, but still had things I wanted to accomplish in my retail and installation business. Later, Bart called again with the same question, but this time I said yes. Four months later, we moved to South Carolina. I always had a passion for teaching and promoting the best way to get things done. Joining CTEF was a perfect fit which I still enjoy nine years later. 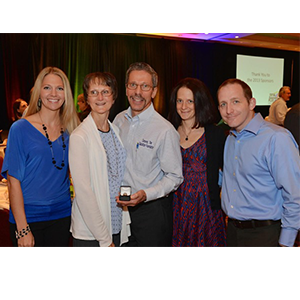 CTEF: You've been active with many tile-related organizations; how and why did you get involved? SC: I received a personal invitation from Jack Vogel, the owner of Conestoga Tile in Harrisburg, Pennsylvania to attend an NTCA Workshop in the mid-eighties. I foolishly said I was too busy to attend. Jack said, “You really need to come and join this fine organization.” How could I say no? I might even learn something. I did attend and joined shortly afterward. I enjoyed over twenty years on various committees and offices of the NTCA. I have often said that if it had not been for Jack and the NTCA, I would not be in this position today. I got involved in the NTCA for a selfish reason. I could learn how to install tile the right way, the first time. After buying my store, I remember my Mother asking, “You are going to put showers on the second floor. Aren’t you afraid they will leak? I said, if they do, I’m dead. That was the driving force to find the best way to get it done. CTEF: How many training and certification sessions do you average in a year? SC: On average, we have done about thirty per year. However in 2016, we should complete over forty. This trend will continue to grow with the addition of additional Certified Tile Installer (CTI) test evaluators strategically located across the United States. CTEF: What are your favorite things about tile? SC: I enjoy being able to transform a plain surface into a work of art that is both functional and long lasting. On the technical side, it is satisfying to help craft industry standards and establish best practices that ultimately help all qualified tile installers do a better job in less time and make more money. 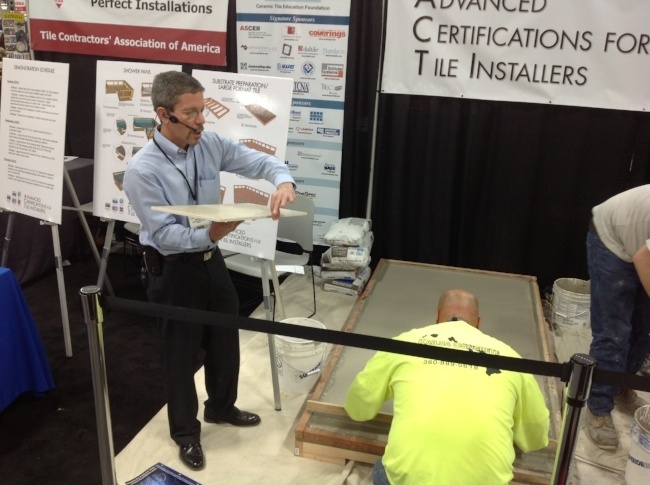 >> See What Types of Tile Certification Does CTEF Offer? Scott and Michael with Tim Evans, LATICRETE rep, Kevin Sebesta with Daltile and Bill Fergison, organizers for this certification! CTEF: What are your biggest frustrations about tile? SC: The constant barrage of complaints and failures provided by poorly trained individuals. I can’t even call them “installers”, because they do not have the ability to properly install tile and the associated products. This scenario gives the entire tile industry a black eye. The problem is that the next time the unhappy consumer, be they residential or commercial, has a choice for floor or wall products, they will select something other than tile for their project. CTEF: What are the biggest trends happening with tile and tile installation materials? How does that affect installation? SC: Since the downturn in the economy has ended, the tile industry has grown and continues to provide new tile and installation materials. The introduction of Thin Porcelain Tile (TPT), as it is currently known, is becoming a real player in the commercial market while it is also becoming popular residentially. This product is a porcelain tile that varies from 3 mm to 6 mm in thickness which comes in two sizes, 1M x 3M and 1.5M x 3. The new Large and Heavy Tile (LHT) mortars replace the previous medium bed mortars providing the ability to install: Large Format Tile (LFT), tiles larger than 15” on one side, tiles that are irregular in thickness such as Indian Slate, and tiles heavier than five pounds per square foot. An installer who meets the requirements of qualified labor as found in the TCNA Handbook, such as a CTEF Certified Tile Installer (CTI) knows what these products are and how to use them correctly. An installer can no longer rely on the age-old statement of, “We’ve done it this way for 20 years and never had a problem.” Things are changing without these uninformed guys and “problem” may become their new middle name. CTEF: What advice would you offer someone wanting to become a CTI? SC: I would first congratulate them for seeking certification and encourage him or her to register to take the online knowledge test and the warehouse-based hands-on test as soon as possible. Their customers deserve a better choice when selecting a tile contractor for their job. Certified Tile Installers are that better choice. CTEF: How should one prepare? SC: Go to our secure website www.ceramictilefoundation.org to register or call Cathey McAlister at the CTEF office at 864-222-2131. CTEF: Any parting words of wisdom? SC: Gather as much information as you are able and apply it to your daily work routine. Treat your customers with honesty and respect while providing the best quality possible.